According to a 2003 count, Indonesia is home to 234,893,453 people, making it the world's fourth most populous nation after China, India and United States. The work force (15-64 yrs of age) is 65.4 percent of the total population and consists of 76,743,613 males and 76,845,245 females. The implementation of a comprehensive family planning program over the last three decades has resulted in controlled population growth. The growth rate has fallen from over 2.3 percent in 1972 to 1.5 percent in 2003. In its ethnic groups, languages, culture, and religion, Indonesia is a very diverse nation. This great diversity is reflected in the country's national motto Bhinneka Tunggal Ika which means "Unity in Diversity." Some 300 ethnic groups call Indonesia home, but most (45 percent) of Indonesians are Javanese. In addition, 14 percent are Sundanese, 7.5 percent Madurese, 7.5 percent coastal Malays, and 26 percent are of other ethnic groups. There are more than 700 languages and dialects spoken in the archipelago. They normally belong to the different ethnic groups of the population. Some of the distinctly different local languages are: Acehnese, Batak, Sundanese, Javanese, Sasak, Tetum of Timor, Dayak, Minahasa, Toraja, Buginese, Halmahera, Ambonese, Ceramese, and several Irianese languages. To make the picture even more colorful, these languages are also spoken in different dialects. Bahasa Indonesia is the national language. It is similar to Malay and written in Roman script based on European orthography. English is the most prevalent foreign language. Also, some Dutch is still spoken and understood in the bigger cities and French increasing in its popularity at the better hotels and restaurants. Indonesia's active history has encouraged the growth of many unique cultures. On Java, the Javanese of Central and East Java are known for having several layers of formality in their language. In Javanese, to speak to a boss and then to a child is like speaking two different languages. The Toraja of Sulawesi are famous for their elaborate funeral ceremonies. Often several days long, these ceremonies bring the whole village together in a feast, a procession, and a hillside burial. And the Minangkabau of Sumatra still maintain a matrilineal society. Everything from houses to animals is inherited from mother to daughter. Today, the country maintains this cultural richness, even as it expands into new areas. The traditional music of the gamelan and angklung coexists with new dangdut and rock and roll. The ancient art of wayang kulit, or shadow puppetry, complements the modern Indonesian film industry. And, while the themes and story from historic epics like the Ramayana persist, newer literature like that of the author Pramoedya Ananta Toer has become an irrevocable part of Indonesian culture. 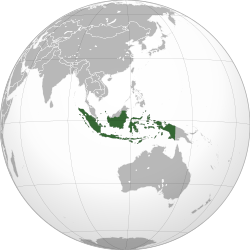 Six world religions are formally recognized in Indonesia: Islam, Catholicism, Protestantism, Confucianism, Hinduism and Buddhism. Nevertheless, other faiths can be found, especially in isolated societies. These religions, called traditional faiths, are also accepted. According to recent counts, approximately 85 percent of the population is Muslim, 11 percent is Christian (Protestants and Catholics), and 4 percent is Hindu, Buddhist, Confucian, or traditional.